A district in eastern Armenia lying between the lakes Van and Urmia and the river Araxes. The Biblical name corresponds to the Assyrian Urarṭu, a land invaded and partially conquered by Asshurnazir-pal and Shalmaneser II. The Assyrian cuneiform characters were introduced into the land of Urarṭu as early as the ninth century B.C., and many monumental inscriptions have been discovered within its boundaries. About the middle of the ninth century a strong native dynasty was established, and continued to rule until the Assyrian power was revived by Tiglath-pileser III., about 740 B.C. For a generation Urarṭu was invaded by Assyrian armies, until at last it again attained independence. This it retained until it was overrun by the Scythians about the end of the seventh century. Thus from the ninth to the sixth century B.C., the land of Urarṭu or Ararat occupied a prominent place among the minor states of southwestern Asia, and is referred to four times in the Biblical narrative. In II Kings xix. 37 (= Isa. xxxvii. 38) the fact is recorded that the assassins of the Assyrian king Sennacherib fled to the land of Ararat, where they found refuge with the reigning king Erimenas. In Jer. li. 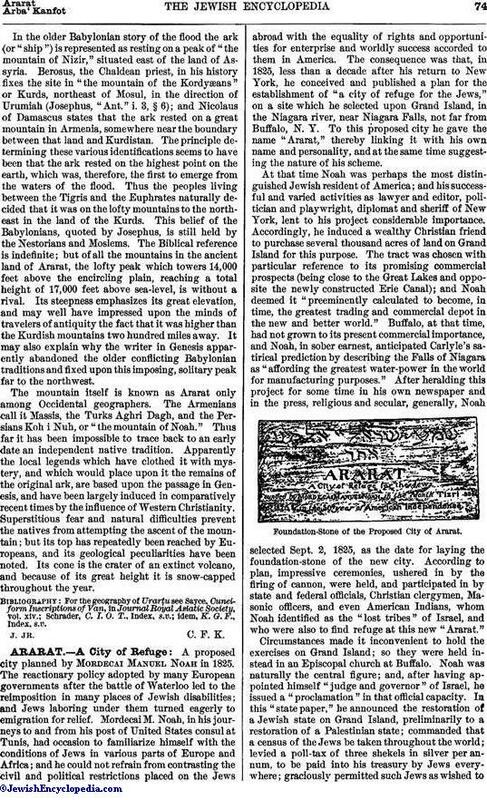 27, Ararat is mentioned first among the hostile nations which are called upon to advance from the north and overthrow the power of Babylon. The most familiar reference, however, is that of Gen. viii. 4: "In the seventh month, on the seventeenth day of the month, the ark rested upon the mountains of Ararat." In the older Babylonian story of the flood the ark (or "ship") is represented as resting on a peak of "the mountain of Nizir," situated east of the land of Assyria. Berosus, the Chaldean priest, in his history fixes the site in "the mountain of the Kordyaeæans" or Kurds, northeast of Mosul, in the direction of Urumiah (Josephus, "Ant." i. 3, § 6); and Nicolaus of Damascus states that the ark rested on a great mountain in Armenia, somewhere near the boundary between that land and Kurdistan. The principle determining these various identifications seems to have been that the ark rested on the highest point on the earth, which was, therefore, the first to emerge from the waters of the flood. Thus the peoples living between the Tigris and the Euphrates naturally decided that it was on the lofty mountains to the north-east in the land of the Kurds. This belief of the Babylonians, quoted by Josephus, is still held by the Nestorians and Moslems. 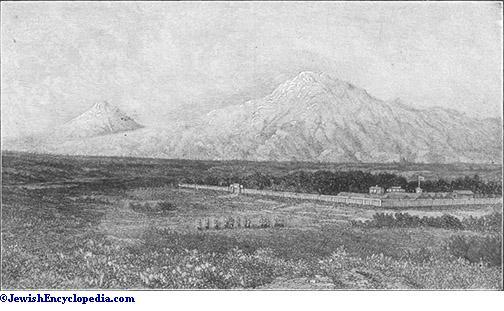 The Biblical reference is indefinite; but of all the mountains in the ancient land of Ararat, the lofty peak which towers 14,000 feet above the encircling plain, reaching a total height of 17,000 feet above sea-level, is without a rival. Its steepness emphasizes its great elevation, and may well have impressed upon the minds of travelers of antiquity the fact that it was higher than the Kurdish mountains two hundred miles away. It may also explain why the writer in Genesis apparently abandoned the older conflicting Babylonian traditions and fixed upon this imposing, solitary peak far to the northwest. 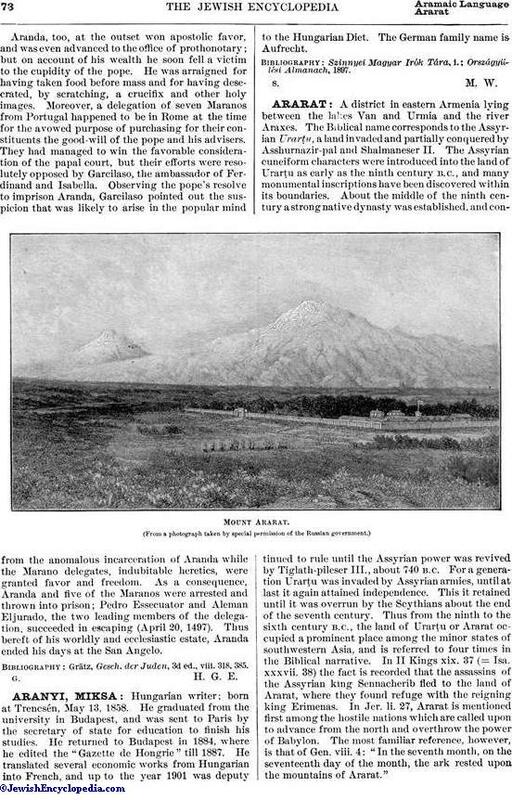 The mountain itself is known as Ararat only among Occidental geographers. The Armenians call it Massis, the Turks Aghri Dagh, and the Persians Koh i Nuh, or "the mountain of Noah." Thus far it has been impossible to trace back to an early date an independent native tradition. Apparently the local legends which have clothed it with mystery, and which would place upon it the remains of the original ark, are based upon the passage in Genesis, and have been largely induced in comparatively recent times by the influence of Western Christianity. Superstitious fear and natural difficulties prevent the natives from attempting the ascent of the mountain; but its top has repeatedly been reached by Europeans, and its geological peculiarities have been noted. Its cone is the crater of an extinct volcano, and because of its great height it is snow-capped throughout the year. Schrader, C. I. O. T., Index, s.v. ; idem, K. G. F., Index, s.v.